Due to recurring small injuries, Doug has not been able to play much tennis recently. So our Saturdays have been occupied by great adventures like hiking and snorkeling. 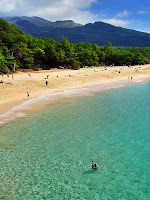 This morning we hiked south along the coast from our house to Makena State Park. Most people are only familiar with the park's beaches, and it has been way too long since we've explored the high crumbling cinder cliffs. 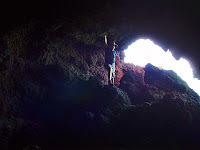 We visited four of our old favorite caves and even found a new cave today. We also spent a long time sitting at the top of a cliff watching the whales go by. It was hunger which finally drove us back to civilization and lunch with the tennis players.